The #2 team in the land will host UT Chattanooga this weekend in their last home game of the season. The Mocs bring their 2-3 road record into Bryant Denny hoping to pull off a miracle. However, in this game I don’t see any chances of an App. State vs. Michigan a few seasons ago. Alabama has won all of the 10 meetings with UTC, and this is the first time the two teams have played in 50 year. This is also Alabama’s last non conference game until bowl season. In non conference games this season, the Tide have scored 127 points and only allowed 45. Even with the Moc’s QB B.J. Coleman (ex. Tennessee player) coming off a career game in a loss to the Citadel last weekend, BAMA’s defense is going to have a field day with this one. 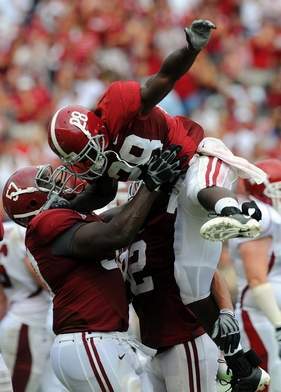 The Mocs will be no competition for these guys due to the depth and level of talent Alabama’s defense presents. In fact, UTC’s running back Chris Awuah weighs in at 190 lbs., more that half of Alabama’s nose tackle Terrence Cody. Let’s hope if these two meet that Terrence doesn’t land on him because I doubt Awuah’s spleen and other vital organs could take it. As for the Tide’s match up on offense. Look for the Tide to score fast with its starters then hopefully thin them out of play in the second half, maybe towards the end of the first. By the end of the game, it should look like the A-day game with both second teams out there preparing for next season. As for Ingram and his Heisman trip, look for him to get his carries in the first half. McElroy and Julio should also connect a few times considering Julio Jones will be too much for anything UTC can throw at him on defense. Star Jackson should see some good playing time, but the thing I am looking the most forward to is seeing Trent Richardson get most of the carries and yards. If things are correct when Mark Ingram said that “ he is further along in his first year than I was at this time,” he should be a force to be reckoned with for the couple of years to come hopefully. On a last note, the tide will be saying goodbye to 26 seniors this weekend before the game. The complete list provided by rolltide.com is Eryk Anders, Javier Arenas, Alex Benson, Evan Cardwell, Terrence Cody, Drew Davis, Brandon Deaderick, P.J. Fitzgerald, Hampton Gray, Baron Huber, Marquis Johnson, Mike Johnson, Tyrone King, Mike McCoy, Colin Peek, Cory Reamer, Chris Rogers, Brian Selman, Ali Sharrief, Leigh Tiffin, Heath Thomas, Jacob Vane, Roy Upchurch, Byron Walton, Lorenzo Washington and Justin Woodall. Congrats to those guys being honored and thanks for everything.